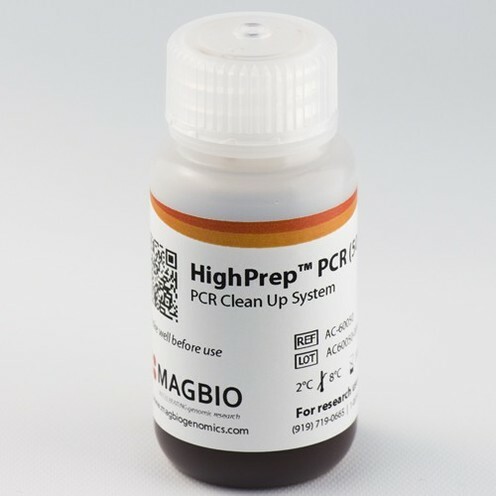 HighPrep™ PCR reagent is a post PCR and Next Gen library prep clean up system based on paramagnetic bead technology, designed for an efficient purification of PCR amplicons. The purification consists of removal of salts, primers, primer-dimers, dNTPs, as DNA fragments are selectively bound to the magnetic beads particles; and highly purified DNA is eluted with low salt elution buffer or water and can be used directly for downstream applications. The protocol can be adapted to your current liquid handling workstation utilizing your current protocol as well as being performed manually. 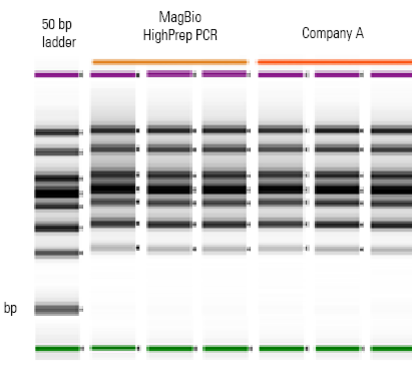 recovered from a 10µl PCR reaction. Data were analyzed on an Agilent Tapestation 2200.